Baku Heydar Aliyev international airport is one of the five international airports serving Azerbaijan. Its previous name was Bina international airport, named after a settlement near Baku. On 10 March 2004, it was renamed after Azerbaijan’s nationwide leader Heydar Aliyev. The airport is located 20 km northeast of the capital Baku and is linked to the city by two modern highways commissioned in 2008 and 2009. 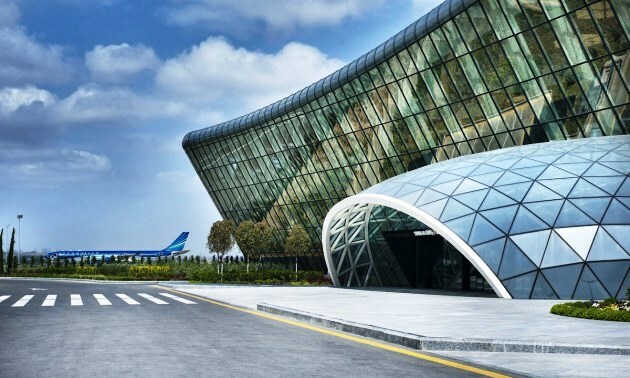 It is the base hub of the Azerbaijan Airlines national flag carrier.There are duty-free shops in the airport’s international terminal. Unlike most other international airports, there are shops not only in the departures but also in the arrivals area. Payments are accepted by credit card, and can be also made in Azerbaijani Manats, US Dollars, Euros and Russian Rubles. Baku Heydar Aliyev international airport complies with international requirements. Due to its favorable geographical location, it has become a first-choice regional airport for transfer flights between East and West, North and South.